This Akdy wall mount range hood has a sleek, attractive European design, with brushed stainless steel and tempered glass wings that curve over the range. Even when the range hood isn’t in use, the air flap keeps heat and air impurities from returning to the kitchen. The fan has 3 speeds, but it’s fairly noisy even at the lowest setting. We were happy to see that the anodized aluminum filters detach easily and are easy to clean in the dishwasher. 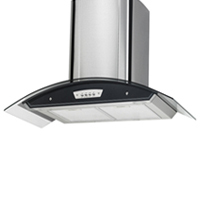 For its low price, $319, this Akdy range hood does a more than adequate job at venting smoke and heat from the range.